This power harvesting skin sensor patch developed at North Carolina State University’s Center for Advanced Self-Powered Systems of Integrated Sensors is a prototype, but it's the real deal. 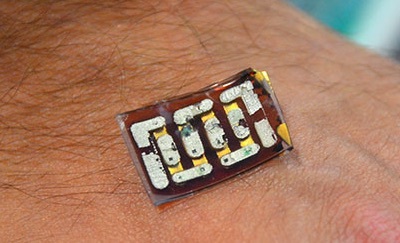 This tiny, flexible sticker, about 7 square centimeters in size, can produce between 40 and 50 microwatts of electricity per square centimeter as long as it's stuck to your skin. This occurs thanks to an array of flexible TEGs wired in series. The amount of power is based on the temperature difference between your skin and the air; the 40-50 microwatt per cm2 output range comes from a difference of just 3 degrees Celsius—with no heatsink or airflow across the generator. If you add airflow into the mix (say, if you're walking or jogging), the generator is much more efficient, producing around three times as much power. A wearable patch like this is never going to produce enough energy to run a display or power a GPS or anything like that. But it's fully capable of running a low power processor along with sensors such as accelerometers, an EKG monitor, temperature sensors, pressure sensors, or hydration monitors. Integrated wireless is also in the works: Researchers are developing an ultra low-power Bluetooth standard for data communication, allowing the patch to talk to your phone. Fans of sf great Frank Herbert remember that the stillsuit from his 1965 masterpiece Dune used power harvesting from the body to run the suit.